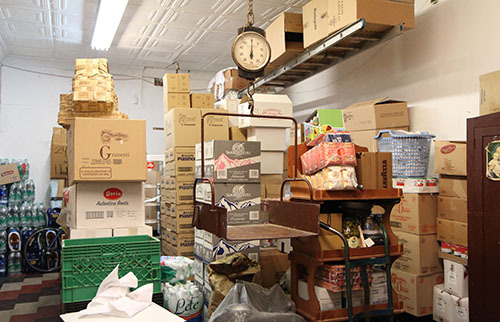 There's one central aisle at Dave & Tony Salumeria. Narrow as a needle and straight as an arrow, it is packed with Italian pastas and cookies, bunches of herbs and cans of tomatoes and olive oil. 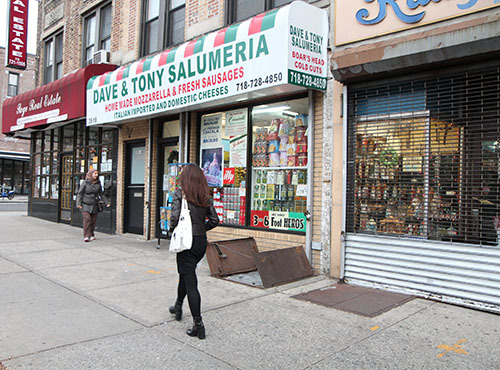 Dave & Tony Salumeria on 30th Avenue at 36th Street. At the back, it cuts to the right, making a short square that bypasses the meat, cheese, sausage and sandwich counter before rejoining the main artery. Right now, it's empty. Well, that's not quite accurate. Albie's walking its length, but she's a cat, not a customer. 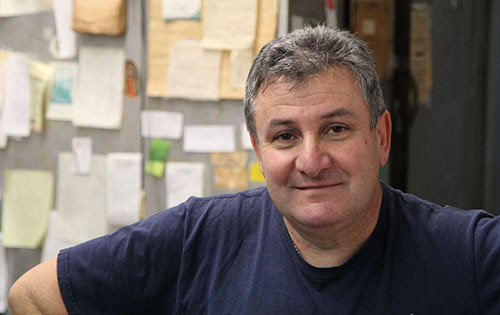 Little lulls like this are luxuries, so Joe Ciccarelli, the owner, heads to the storeroom to unpack some boxes. 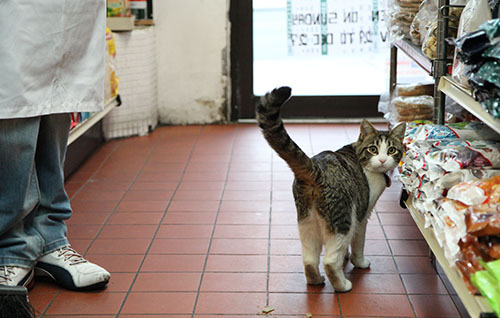 Raffaele Dipietro stands by the counter, waiting for the next sale, and Carlos Castillo grabs a broom and sweeps the floor, playing cat and mouse with Albie. Dave & Tony has been around for a long time. 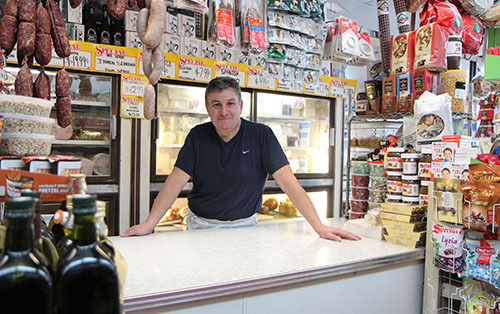 By Joe's reckoning, the Italian deli is 45 to 50 years old. Before that, it was down the block and had a different name, but that was before his time. Joe, who wears his grey hair short and his white apron wrapped snugly around his round waist, became co-partner in 1986 and the only owner in 1998. "In 40 years, nothing has changed," he says, adding that the ceilings are still tin, the floor is still checkerboard linoleum and the wrought-iron scale, which stops weighing in at 100 pounds, still works. 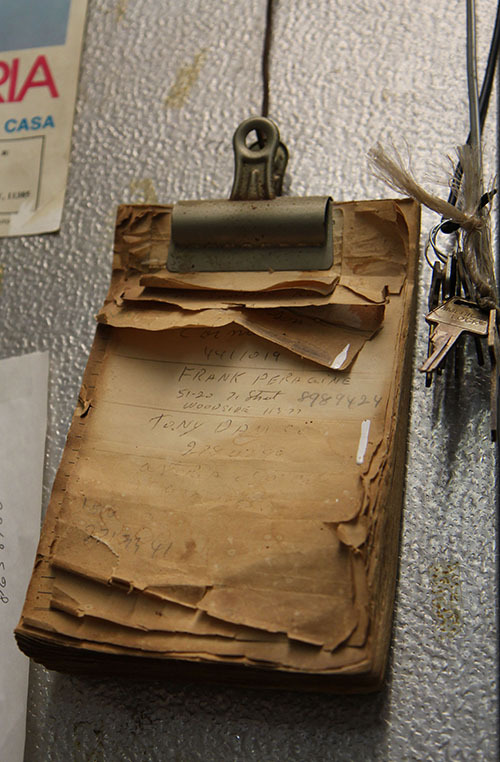 "We're an old-fashioned Italian deli." Joe doesn't have to tell you this. You can see it even before you walk in. The awning, red, white and green like the Italian flag, quaintly announces the shop and proclaims it is a salumeria, which technically is a cured-meat shop but also is used to describe a deli. The front window is stuffed, like a Thanksgiving turkey, with brightly colored packages of Italian edibles. Raffaele mans the front counter. 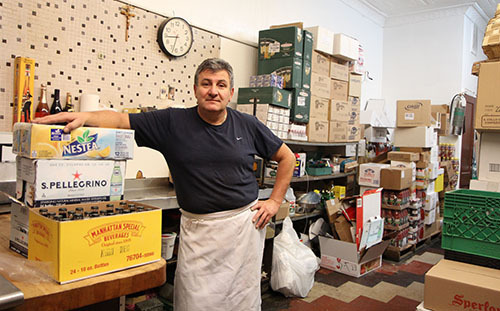 Joe, who is from the tiny town of Alife, Italy, came to Astoria with his parents and older sister when he was 11. "We lived on a farm," he says. "We had five or six cows and sold milk and cheese and vegetables. I didn't know any English and had never been any place but there." For a time, they lived with Joe's aunt then moved next door to her. Carlos joined the staff a decade ago. 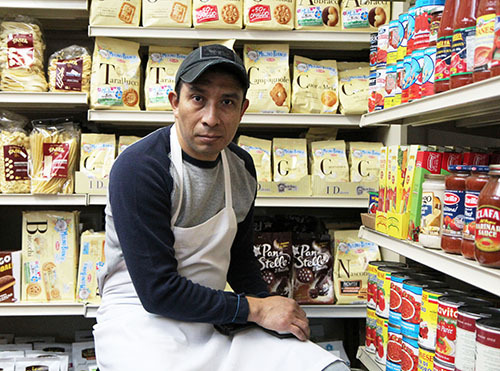 Joe began working part time in a deli when he was 14. After high school, that became his full-time job. For five years, he worked for a private sanitation company on Long Island and did weekend shifts at Dave & Tony, where his father worked. When one of the partners retired, Joe took his place. As the years went by, he married (she was the granddaughter of the owner of the first deli he worked for), had a son and daughter and settled in Whitestone. In 1998, Raffaele, a cousin of Joe's wife, joined him, and Carlos came a decade ago. "It's just the three of us six days a week, 6 a.m. to 7 p.m.," Joe says. "We all do all the jobs. We're a good team." Joe came in the 1980s. 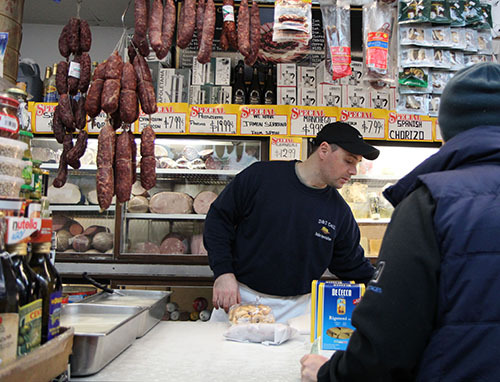 In addition to serving sandwiches to counter customers, the three of them make mozzarella and sausages, notably sopressata, cacciatorini and coteghini, which traditionally is added to New Year's good-luck lentil soup. The shop also carries delicacies like salted baccalà cod fillets and stoccofisso (air-dried and salted whole cods that look like driftwood and need to be soaked in water for five to six days to be softened enough to heat and eat). 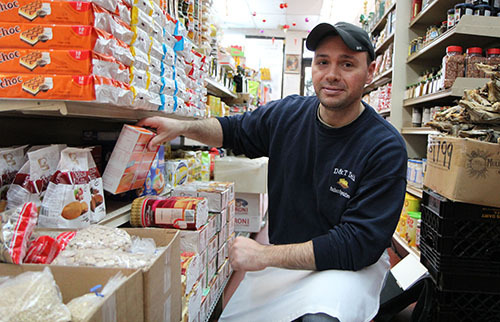 It's getting harder for mom-and-pop shops like Dave & Tony to survive. The Italian ladies who used to come in every day for sausages and tomatoes left life and Dave & Tony's long ago. The new kids on the block don't cook. They stop in to buy some mozzarella and pay $2 tabs with credit cards. "It's a lot harder than when I started," he says. 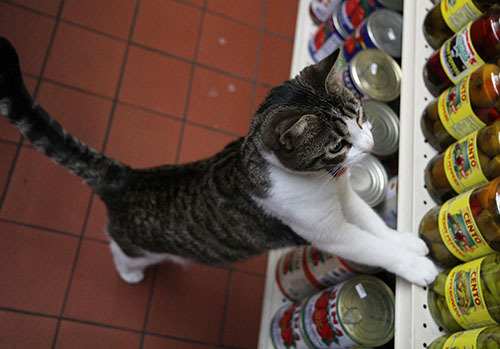 "A lot of the supermarkets carry the Italian products." Joe has thought about making prepared food, which is what the newcomers desire, but he's 56, and it would take a lot of time and money to add a kitchen. Joe has seven to eight years left before retirement. Joe hasn't thought much about retirement, other than he can't wait for it to commence. The stress and long hours are getting to him. Why, just the other day, a customer complained that he had given her friend three pounds of sausage and charged her for four. A phone log left by a previous partner. Joe had her bring it back to be reweighed. She was right. He was off, but not by a pound. He holds up his hand to show how much: an inch. "I kept worrying about that," he says. "I couldn't sleep. How could I have been wrong?" When the subject of succession is brought up, Joe says that you won't see his kids in his place. His 24-year-old daughter has a good job, and his son, who is 18, has other ideas about his future. Joe ready to help a customer. 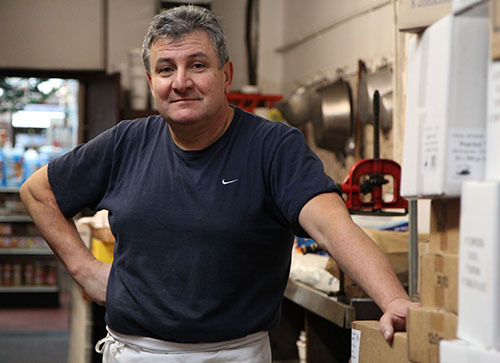 Raffaele wants to stay in the food business, but he's not sure that that means Dave & Tony's without Joe. Joe isn't going to worry about it now. He figures he has seven or eight years left to work things out. "It's a job," he says. "It's a business." He walks toward the back and twirls around. Why, of all things, he's forgotten his manners. "Do you want a sandwich?" he calls out.